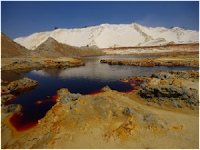 The Federation for a Sustainable Environment, supported by 36 civil society organisations including JAG, has issued a statement calling on the South African government to engage with civil society on the urgent issue of acid mine drainage in the Witwatersrand Mining Basin. The statement calls for disclosure of all documentation regarding the issue, much of which has not been released into the public domain, and also for urgent action dedicated to finding a sustainable and just solution to the problem. We strongly support this statement, which you can read in full here. Image: "Acid Mine Drainage on the West Rand Gold Fields" courtesy of Earthlife Africa. Click through to Earthlife's web site to read its Acid Mine Drainage Fact Sheet 1 and Acid Mine Drainage Fact Sheet 2.